Robert Wilkinson Primary Academy » What is the Childcare Hub? 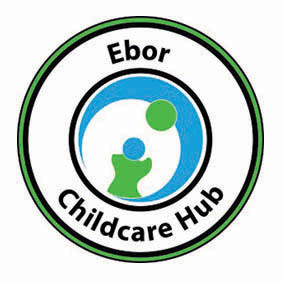 What is the Ebor Childcare HUB? The Ebor Childcare HUB is a group of early years and childcare providers working together in partnership in Strensall and Flaxton. Our partners include Little Green Rascals Flaxton, the Montessori Nursery, Robert Wilkinson Primary Academy, Robert Wilkinson Preschool, Stepping Stones Nursery, and local child-minders. The aim of a Hub is to bring together different providers of early years education and childcare for children aged 0-11 in a local area. The HUB is a great way of signposting parents to what childcare is available within their local community. The Childcare HUB project is funded by the Department for Education. The Ebor Childcare HUB is one of six HUBS chosen to pilot the project by the government to bring together high-quality daycare providers and childminders to develop a sustainable partnership model for a more flexible and responsive childcare offer locally. Aim to improve the quality of teaching and learning in the Early Years. Raise awareness of local childcare providers with availability for 2-year-olds within Strensall and Flaxton. Raise awareness of out of hours childcare that is available across the different settings in the local area. For example, the breakfast club and the after school club at Robert Wilkinson Primary Academy. Inform parents about the wide choice and availability of different child-minding facilities in their area. One of the greatest benefits of being a HUB is the fact that Robert Wilkinson Primary Academy has close working links with all the nurseries and childcare providers in the local area; allowing us to share best practice and take part in joint training initiatives. All of this helps to build a stronger foundation for local children during their early years.